Donald Trump's campaign rhetoric showed no mercy for climate change policy, but there's reason to believe energy storage will continue to flourish under his presidency. It's not clear that Trump himself thinks much about energy storage. There are few, if any, instances of him mentioning it specifically in public. The 2016 GOP party platform, though, promised that a Republican administration would "find new ways to store electricity, a breakthrough of extraordinary import." That reference came in the context of grid modernization and resilience efforts. It's worth noting that, even under President Barack Obama's diligent efforts to expand clean energy and reduce greenhouse gas emissions, federal energy storage policy is still virtually nonexistent. A bill to give storage an income tax credit like the one solar energy enjoys has been introduced in both houses of Congress, but hasn't moved very far. 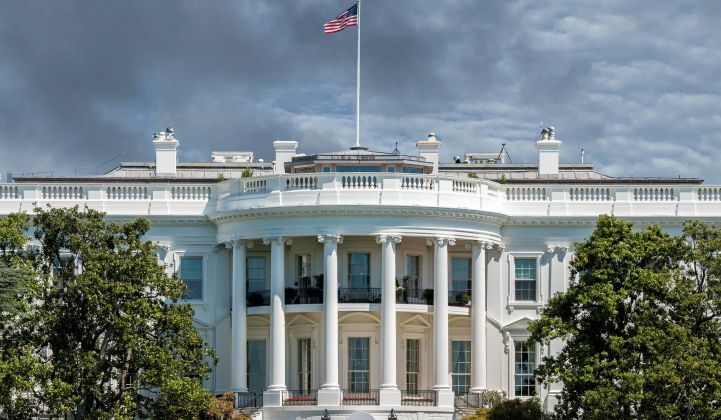 When the White House hosted a storage summit this summer, it showcased a collection of ongoing efforts, but did not break much new ground. The states that have largely driven the expansion of distributed energy resources through strong policy and regulatory action will continue to do so, and their ranks are growing. "There are a lot of opportunities that will now shift from a federal focus to a more distributed focus, no pun intended, with cities and states in particular," said Sen. Martin Heinrich (D-NM), one of the most vocal proponents of energy storage on Capitol Hill. Any industry would be remiss, though, to not seek greater representation in the policy agenda of an incoming administration. For energy storage, this likely means a pivot from messaging around decarbonization and renewables integration to a greater emphasis on the role of storage as infrastructure for a safer, more resilient grid. The ITC helped boost the fledgling solar industry and get it to scale. It now employs more people in the U.S. than oil and gas or coal extraction. Storage advocates were hoping that legislators would apply the same logic to storage. There's still a chance the storage ITC could pass, but it's going to be tough. Heinrich said he is working on moving the ITC by the end of the year, along with the "orphan" renewable energy tax credit extenders for things like small wind and geothermal energy, which were negotiated in the budget compromise of 2015 but left out of the final wording. Energy storage tax credits wont pass as a standalone bill, but they could end up in a must-pass bill to keep the government funded. The "continuing resolution" has become a curious annual ritual in D.C., a last resort to keep the government operational for a few more months in the absence of a real budget agreement. Due to the critical nature of appropriations bills, they provide opportunities to get smaller items included as part of the grand bargain. The solar ITC and wind production tax credit extensions were passed in last year's compromise spending package. The outcome of the election altered congressional Republicans' incentives to compromise, though. "They don’t have any incentive to do anything in the lame duck [session], other than keeping the government going," said Katherine Hamilton, a partner at 38 North Solutions in Washington, D.C.
Everything else can wait until a fellow Republican occupies the White House. The Senate version of the energy bill, which is currently in conference with the House, also contains R&D funding for energy storage. It looks similarly doubtful that this will be finalized in the lame duck session. If the ITC falls through, it wouldn't be the end of the world for storage. "Storage has opportunities that potentially are nonpartisan and could be inserted into legislation that is more related to grid modernization than to any particular energy source," Hamilton said. The "storage for grid modernization" pitch jibes with the GOP platform and primes storage for inclusion in the major infrastructure bill that Trump has promised for his early days in office. It's been years since there was a strong consensus on infrastructure spending in Congress, and such legislation offers a chance for many constituents to get something they want. The industry group Energy Storage Association has already begun conversations along these lines, said Executive Director Matt Roberts. "We would want to see a large investment in the grid infrastructure, and we believe storage can play a big role in it," Roberts said. Storage is uniquely suited to bolstering grid resiliency against severe weather and cybersecurity threats. It enables greater decentralization of the grid, which reduces the impact of failures at critical junctions. This has already caught the attention of the General Services Administration, which is exploring storage for backup power in federal offices. Storage has a lot to offer the Federal Emergency Management Agency or the Department of Homeland Security, Roberts added. It could be used, for example, to keep city halls across the country operational in the event of a blackout. Grid-scale storage allows utilities to defer expensive upgrades to substations and transmission lines, which might make it attractive to conservatives. Commissioner Bob Stump of the Arizona Corporation Commission, a Republican who penned a conservative critique of Trump's energy policy in June, noted in an email that energy storage is a key technology for reducing peak load, which is a major driver of the cost of electricity. He said he hopes Trump looks to state-level experiments in energy policy for guidance in crafting a national policy. Luckily for the industry, storage appeals to both utilities and to customers. It can avoid the types of clashes that arose between the residential solar industry and utilities, which in some places devolved into a zero-sum battle for customers. That might change if it becomes big enough to cut into the revenues of gas peaker plants or other incumbent generators, but that's still a ways off. Storage advocates have a few other avenues to pursue at the federal level. Congress passes a defense authorization bill every year, and that could be an occasion to look at ways that energy storage serves the mission of the military, Heinrich said. The GOP platform characterizes clean energy requirements as a financial burden for the Defense Department, but early adopters in the Navy have said investments in solar and storage save money and enhance the branch's ability to defend the country. The wonky nature of FERC has kept it out of the political spotlight and makes it harder to predict what Trump will do with it. Democrats on the commission will hold a majority until June. If Trump appoints commissioners who side with big, centralized utilities, it could slow down development of markets for distributed energy resources. FERC could accelerate the rise of storage by adjusting regulations on how storage competes in the markets. As ESA's Roberts describes it, "Storage gains a lot of its value from its speed and response time. If the grid only measures things in hours, being able to deliver in 5 minutes doesn’t really map out." "The ITC is a mechanism that has done wonders for the solar and wind industries and absolutely can have an impact in driving storage forward," Roberts added. "But really the key is having markets that recognize the value energy storage delivers and integrates energy storage into the planning and modeling of the system." The picture that emerges here is an industry that does not hinge on any particular federal action, but could grow much faster with well-crafted federal support. Storage has thus far avoided the partisan shadow that grew around solar power, and it fits neatly among the principles of both parties. If anything, the primary obstacle it faces is a lack of basic awareness. To learn more about this and other pressing storage industry developments, join Greentech Media for U.S. Energy Storage Summit Dec. 7-8 in San Francisco. Now in its second year, the summit will bring together utilities, financiers, regulators, technology innovators and storage practitioners for two full days of data-intensive presentations, analyst-led panel sessions with industry leaders and extensive, high-level networking. Learn more here.